Report Kahnu Nanda; Jagatsinghpur: Director General of Police R P Sharma stressed on Friday that extensively on the need for friendly policing and behaving well the people. 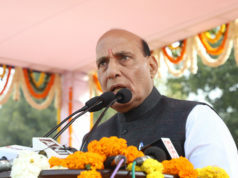 Sharma said that people are the ultimate bosses of police because they elect the governments which appoint police personnel as per the laws framed by them, thus according to the DGP is nothing but people electing police. 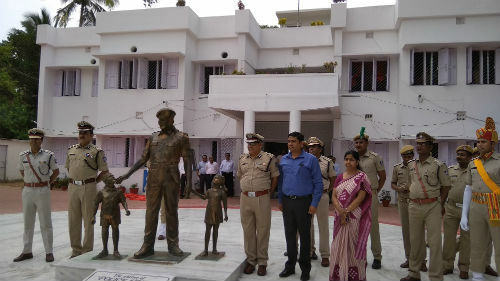 DGP Sharma in his maiden visit to Jagatsinghpur on Friday unveiled a police Uncle statue inside the police headquarters here, symbolizing cops sociable attitude towards children and general public later addressed an open sky meeting with school children of locality, interacted with them with various subjects of policing. Addressing children DGP Sharma said that policing system in India is a relic inherited from the British Raj. The centralized police organization with its inherent anti people and pro administration bias proved an ideal tool of colonial suppression. 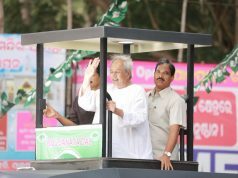 In recent times there have been ever increasing protests against the continuation of these antiquated concepts. The chorus in favour of change to people friendly policing has gained strength with concerned of social activists, citizens and itself by police personnel with a systematic overhaul becoming essential to arrest further degeneration. Subsequently traditional Indian methods of policing has become unacceptable by people so participation of citizens seems to be the best option available to be nearer called as people friendly policing, DGP said. Moreover DGP urged children that police are their uncle, the statue he unveiled inside the police headquarters here showing how cops are friendly and affectionately to Children, DGP Sharma maintained. In interaction session with DGP the local school children were asked many questions relating to police operations and functioning with regards to crime control and maintaining safety and security to children. DGP Sharma and IG central range Soumendra Priyadarshi , SP Jainarayan Pankaj and collector Yamini Sarangi were answered the children’s queries. SP Jai Narayan Pankaj by whose efforts the police uncle statue was unveiled following assistance from PPT’s CSR funds addressed at the gathering said we should exceed people’s expectations on us and should protect our self-respect at any cost, protection of people must be our foremost priority and while doing this we should earn respect among the people whose tax money we are being paid as salaries, SP told at the interaction session. 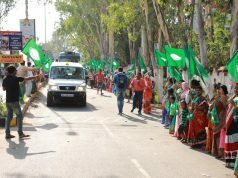 Next articleJagatsinghpur residents demand railway connectivity to district HQs.